We are facing an oil crisis, we all know by now. We cannot hide. We cannot continue to live like this. More investment in renewable energy is essential. But we should consider how much energy we are wasting in every thing we do. Yes, don’t leave the telly on standby, and remind the kids not to leave the lights on. But what about the heat on the bonnet of your car? In fact, a car only uses about one third of the energy supplied. Factories waste phenomenal amounts. But this could all change because of skutterudites. 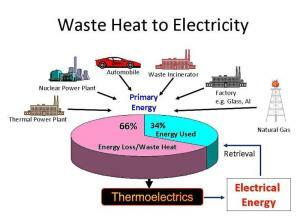 ScienceDaily (Sep. 21, 2011) — More than 60 percent of the energy produced by cars, machines, and industry around the world is lost as waste heat — an age-old problem — but researchers have found a new way to make “thermoelectric” materials for use in technology that could potentially save vast amounts of energy. Thermoelectric generation of electricity offers a way to recapture some of the enormous amounts of wasted energy lost during industrial activities. And it’s based on a device found everywhere from kitchens to dorm rooms: a microwave oven. This is an example of how investment in Science in our universities and in our industries can really help provide solutions to the crisis we face. We cannot hide our heads in the sand, we must face up to the Oil Crunch which is imminent. But we can do it without fossil fuels, without nuclear fuels and without risking our children’s future or the planet. Labour must address this.. We cannot trust the Tories. They are not “The Greenest Government ever” Far from it. Their priorities are their own short term interests and those of their friends. This entry was posted in Environment, Science and Research, Topical News, Uncategorized and tagged energy, oil crunch, skutterudites, thermoelectrics, wasted heat by Pamplemousse. Bookmark the permalink.